Easter is a wonderful time for Christians and they celebrated this event in all around the world. People mostly wish to each others with Happy Easter messages. Wishing to others with messages is considered very simple and easy way. This year find best and unique collection of Easter text messages and send it to your dear ones. 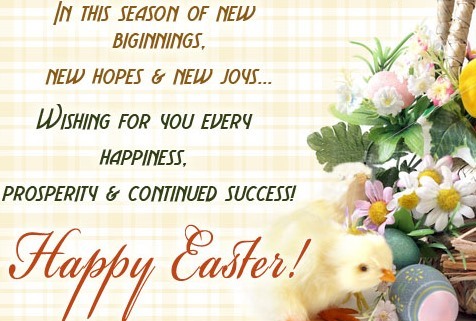 We are presenting you here huge and top collection of happy Easter messages. I love you, Dad! Happy Easter! Hey there, Little one! Hope your Easter’s a basket of fun! Hoppy Easter! May your day be filled with the hippitiest hopping ever! Happy Easter!May it fills with bleesings. Celebrate the day that our Savoir has resurrected! Be blessed and have a meaningful Easter. May u Live Long LIFE… And That EASTER day Will comes in UR life Hundred Times… Remember me in ur prayers.. The Easter feeling does not end, it signals a new begging of nature spring and brand new life of friendship. Happy Easter to My Best Friend!